Letters and Numbers - Giant, Big, Oversized made from cardboard, foam, wood & Plastic - Dino Rentos Studios, INC.
Dino Rentos Prop Studios are one of the leading manufacturers of Big Letters and Numbers for all your Event, Trade Show, Retail Store or Party needs. As there are many options, please take the time to review the best options for you. Feel free to call us for any assistance you may need. Custom Foam Logos are awesome "Show Stoppers" and make a great statement wherever they're displayed! Each logo is manufactured custom to our clients needs. They vary in design and detail. Give us a call for a custom quote today! Foam letters are custom cut to your font request, then painted your needed colors. You can also have your foam letters plastic coated for added durability. 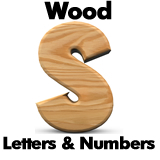 Wood letters are custom cut to order. Each letter is cut from quality Oak Plywood. The letters can then be painted your desired color. 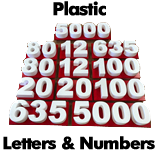 Choose from our Expanded PVC or 3D Printed Plastic Letters and Numbers. Expanded PVC Letters: PVC Letters are durable and versatile. They are strong and great for both indoor and outdoor use. Printed Plastic Letters: Our Printed Plastic Letters are 3D Printed with PLA Plastics. PLA Filament helps produce higher quality products. The letters can be provided unfinished or sanded. These are flat letter cutouts. They have a cardboard beam behind them to make the letters self stand. Cardboard Cutout letters are NOT 3D, and are just flat. They can be manufactured in single, double or plastic cardboard. 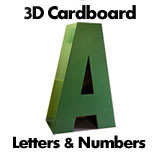 These are 3D Cardboard letters (Shown below). They come packed flat and are assembled by you. Each letter takes 2 people and 30 minutes to assemble. They can be printed any color. Two toned or even with a photo. 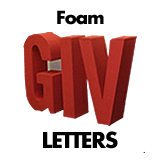 Though it takes some effort on your part to assemble, the price is more than half of a foam letter and can ship via UPS, saving you dollars! 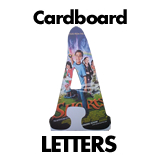 The 3D cardboard letters are offered in both 72" (6 foot) tall and 48" (4 foot) tall sizes. Now anyone can purchase custom cardboard giant 3D letters at a reasonable cost. Letters & Numbers 3" to 6"